Download "Fileweave. Large File Transfer. Seamless Microsoft Outlook add-in. Simple drag and drop functionality"
5 A smart and simple platform that works with you. 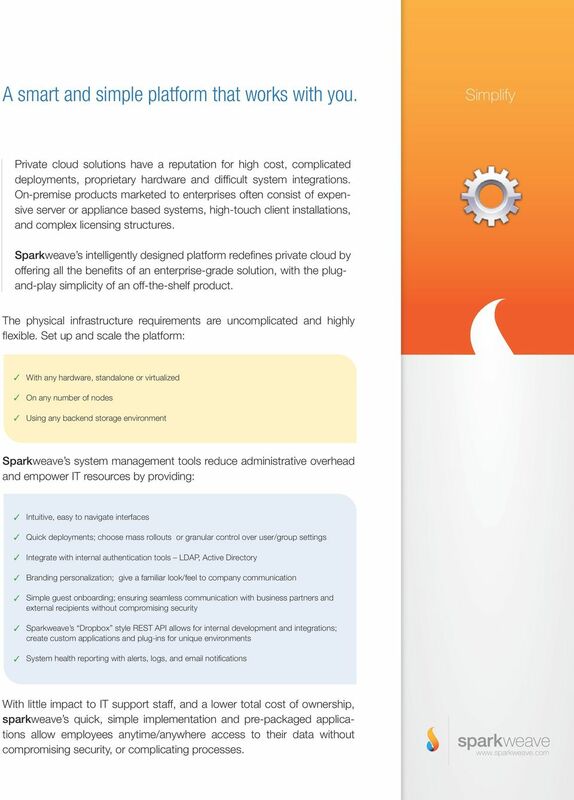 Simplify Private cloud solutions have a reputation for high cost, complicated deployments, proprietary hardware and difficult system integrations. 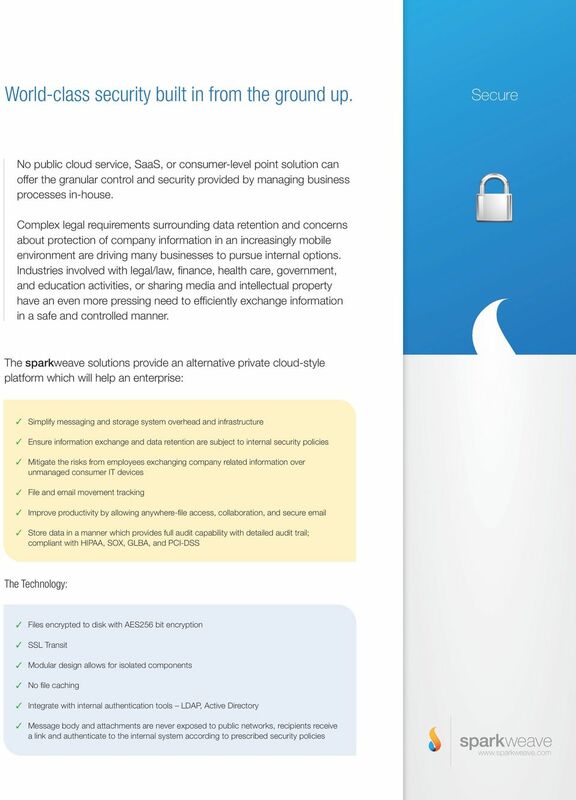 On-premise products marketed to enterprises often consist of expensive server or appliance based systems, high-touch client installations, and complex licensing structures. 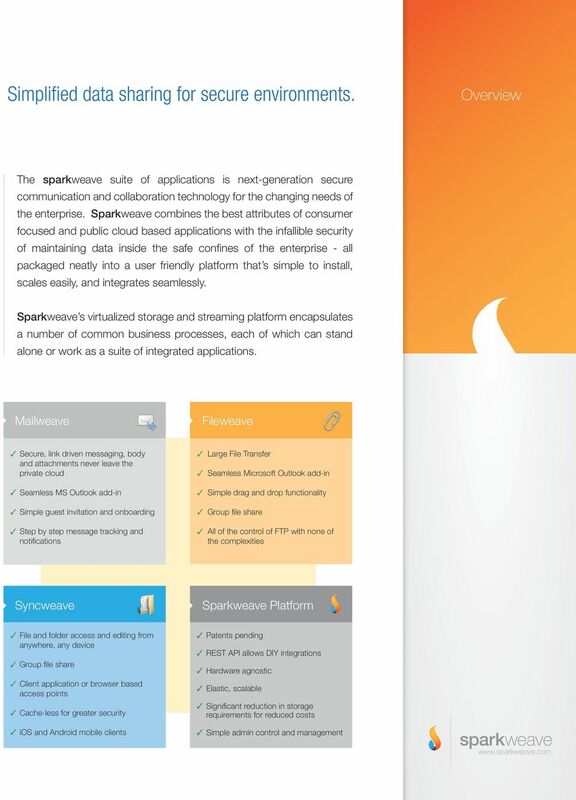 Sparkweave s intelligently designed platform redefines private cloud by offering all the benefits of an enterprise-grade solution, with the plugand-play simplicity of an off-the-shelf product. 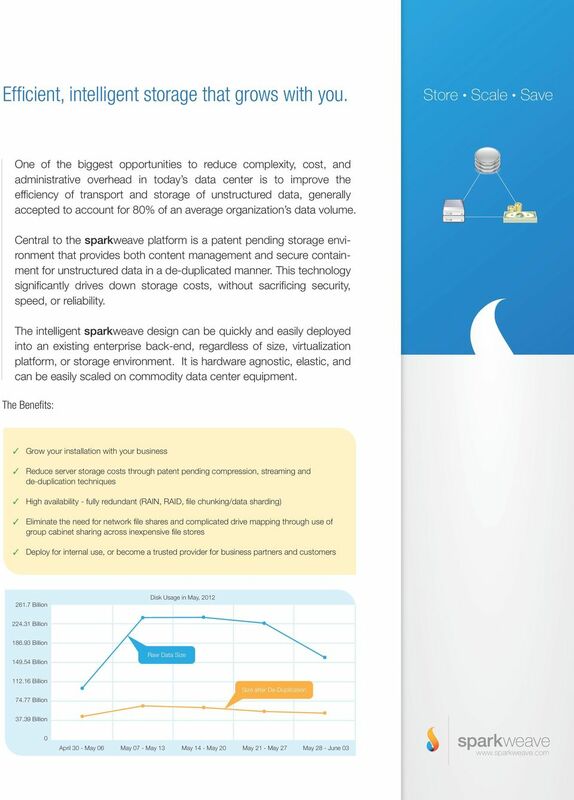 The physical infrastructure requirements are uncomplicated and highly flexible. 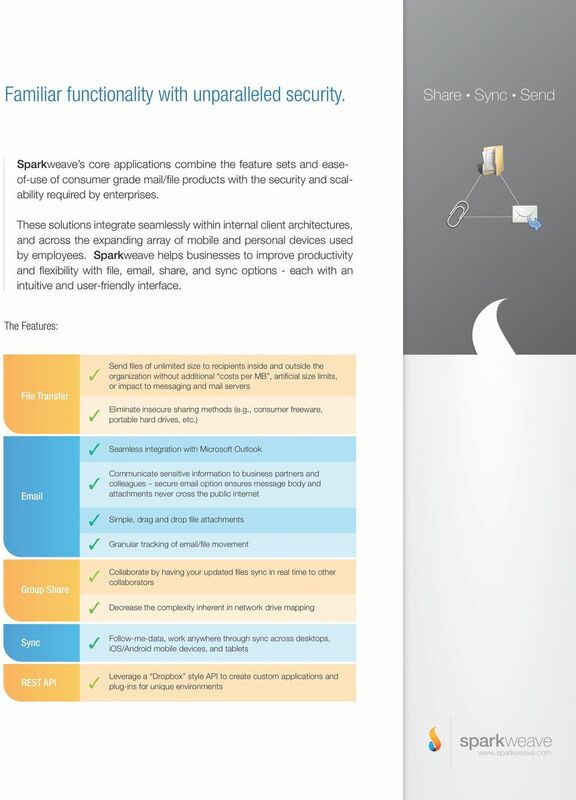 Set up and scale the platform: With any hardware, standalone or virtualized On any number of nodes Using any backend storage environment Sparkweave s system management tools reduce administrative overhead and empower IT resources by providing: Intuitive, easy to navigate interfaces Quick deployments; choose mass rollouts or granular control over user/group settings Integrate with internal authentication tools LDAP, Active Directory Branding personalization; give a familiar look/feel to company communication Simple guest onboarding; ensuring seamless communication with business partners and external recipients without compromising security Sparkweave s Dropbox style REST API allows for internal development and integrations; create custom applications and plug-ins for unique environments System health reporting with alerts, logs, and notifications With little impact to IT support staff, and a lower total cost of ownership, sparkweave s quick, simple implementation and pre-packaged applications allow employees anytime/anywhere access to their data without compromising security, or complicating processes. Recovery is Everything Agentless Cloud Backup and Recovery Software for the Enterprise T: 020 7749 0800 E: asigra@datrix.co.uk W: www.datrix.co.uk Your company s single most valuable asset may be its data. WHY HOST MICROSOFT EXCHANGE WITH SMARTPATH TECHNOLOGIES? WHY YOU SHOULD CONSIDER CLOUD BASED EMAIL ARCHIVING.